Gourmet Help: Is Slow-Cooker Food Safe to Eat? The idea of slow-cooking food for eight hours on your countertop might trigger fears of bacteria and other unwelcome food invaders. But according to Mark Tamplin, M.D., a USDA microbiologist and food-safety specialist, it's not a problem: "You won’t see growth of harmful organisms in a slow cooker." According to FDA guidelines, cooking food at temperatures above 140º F ensures "significant destruction of bacteria." 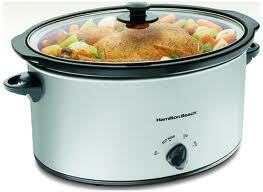 Slow cookers operate at temperatures between 170º F and 300º F, well above the FDA recommendation. But bacteria thrive at what the FDA calls the "danger zone"―40º F to 140º F―and can multiply rapidly in food left at room temperature for long periods, so it's better to let your cooker cook on low until you get home than to set the timer to shut it down in the early afternoon. To reheat leftovers properly, you should heat food until it's steaming hot. If you leave food in a slow cooker that's been turned off, Tamplin warns, "try not to leave it out for more than four hours." And make sure that the cooker is on the "warming" function if you leave food in it during a meal―and immediately refrigerate any leftovers in airtight containers.